Canon announced today activities to bring the visitors and at-home fans closer to the 18th Asian Games. In the spirit of the Games, Canon is bringing the 180-degree GIF booth to Jakarta for the Canon Experience Center located at the Kaka Festival Area, Gelora Bung Karno (GBK) Sports Complex. Canon has also set up 9 prime photo spots to help spectators get closer to the action at GBK, while Canon Touch and Try booths in 3 key locations let visitors try Canon’s latest cameras and printers in between the action. 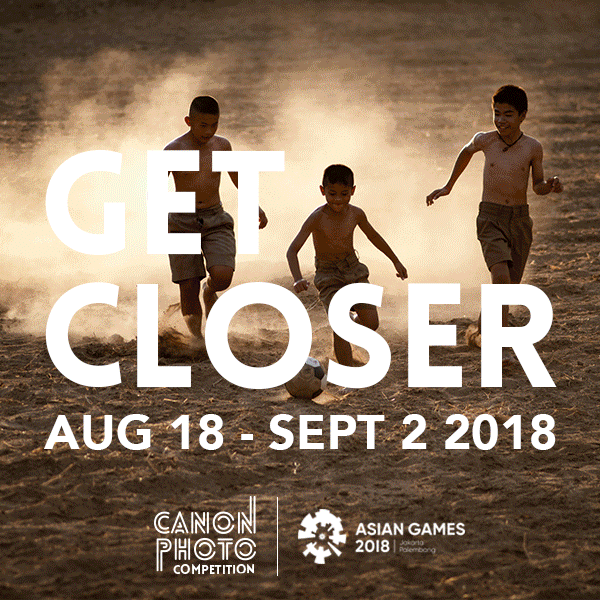 For fans across the region, a photo competition on Instagram is ongoing from 18 August to 2 September to celebrate the spirit of sportsmanship and unity during the Asian Games. Canon has been a fixture in major international sporting events, from the Olympics to the Southeast Asian Games. To enhance the fun factor, Canon is bringing the 180-degree GIF booth to the Canon Experience Center at the Kaka Zone of the Gelora Bung Karno. Powered by 12 Canon EOS 1300D DSLRs, visitors can take home their own piece of the action and share their Asian Games experience on social media. 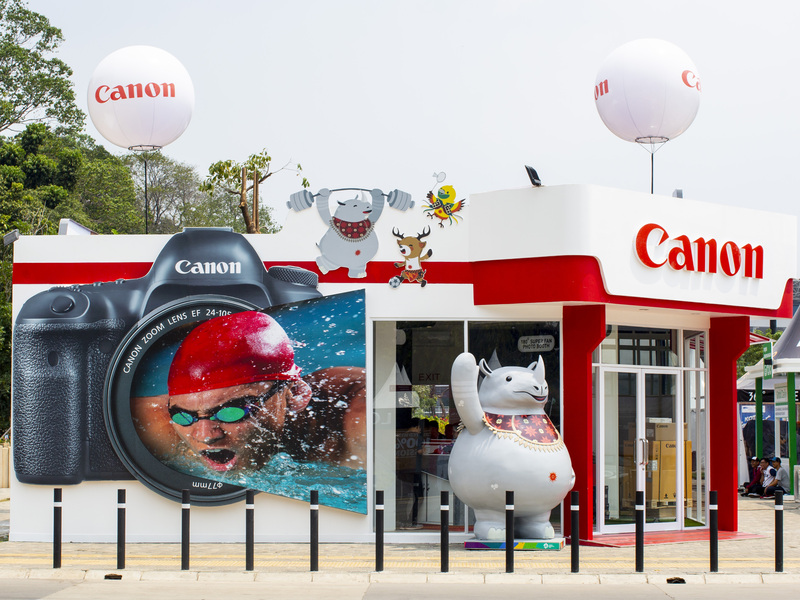 The center also features the latest Canon consumer products, and a print center where fans and visitors are welcome to print their photos, schedule of the Games, as well as a map to the best photo spots at the various venues of the Asian Games. Canon has arranged for 9 different Canon Photo Spots for the best vantage point to take photos of key events, located in several facilities across GBK Sports Complex:, Aquatic Center, Rugby Field, Baseball Stadium, and Istora (Badminton Hall). Canon has also set up Touch and Trial booths at three key locations: Aquatic Center, Basketball Hall, and Istora (Badminton Hall). Visitors can zoom closer to the sporting action through Canon’s cameras and binoculars. 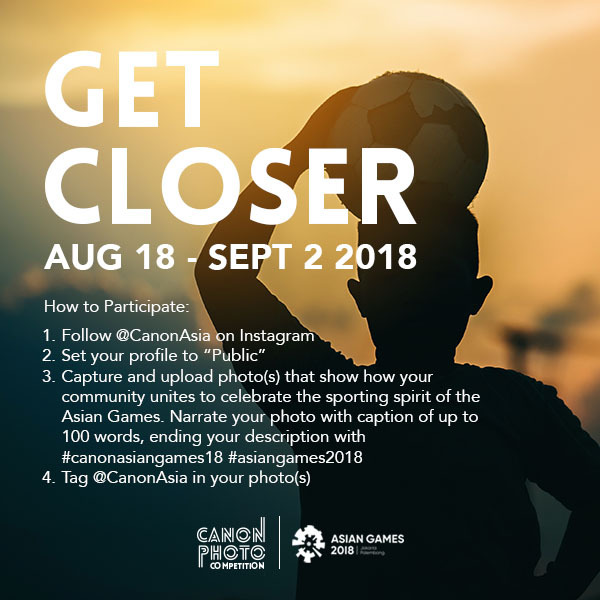 Spectators at home can also get in on the action with the #CanonAsianGames18 Asia-wide Instagram photo competition hosted by @CanonAsia. To celebrate the spirit of sportsmanship and unity during the 18th Asian Games, Canon is inviting everyone to share how their community celebrates the #AsianGames2018 for a chance to win prizes from Canon. 3. Capture and upload photo(s) that show how your community unites to celebrate the sporting spirit of the Asian Games. Tell us the story behind your photo with caption of up to 100 words, ending your description with #CanonAsianGames18 #AsianGames2018.